The program will take place weekly, and will run for an hour broadcast on FM Capital; every Saturday local commentators will talk about various topics related to Basque culture like film, literature, and the most important celebrations of the Basque calendar. The Comahue Basque Club will also begin to finalize other 2018 projects in April like its Basque workshops and dance as well as a seminar on Basque literature to mention a few. Neuquen, Argentina. 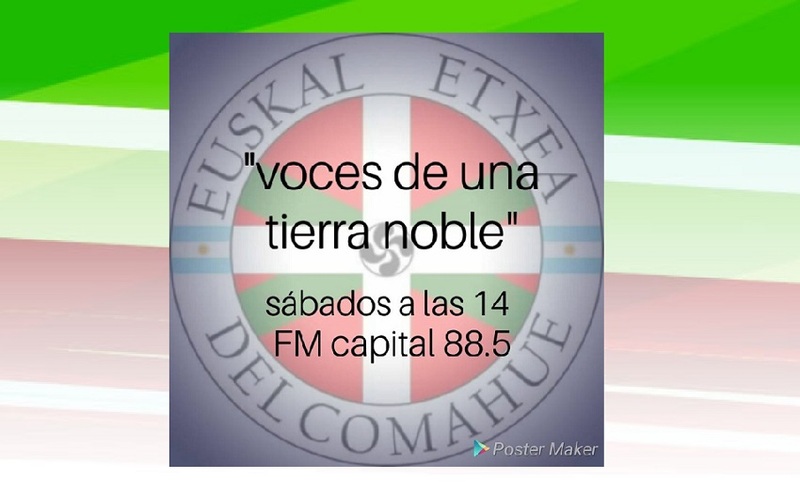 “Voices from a Noble Land,” is the official voice of the Comahue Euskal Etxea and its members Sonia Beltran, Francisco Sevila, and Manu Molina are in charge of producing and running the series. The program will focus on the most relevant aspects of Basque culture and customs of the Basque Country as well as sharing activities carried out by the club. Once a month, the series will also include the participation of Gloria Siracusa, Adjunct Professor at the Chair of Spanish Literature 1 and 2 at the National University of Comahue, who along with Lorena Pacheco (head of practicums), will speak about Basque literature. They are also hoping to add a film expert soon. “Voices from a Noble Land,” will begin airing on Saturdays from 2-3pm on FM Capital, 88.5 on your radio dial. Anyone outside of range can also enjoy the program on the internet here: www.capital885.com.ar. Other projects that will begin soon at the club, according to club president Manu Molina, are its Basque workshops that will begin soon online provided through Euskaltzaleak in Buenos Aires. In May they will host their Basque film series at the Fine Arts Museum, and a delegation from the club will travel to Comodoro Rivadavia to participate in the 5th Patagonian Basque Club meeting. Besides its radio program the Comahue Basque club also holds a place for Basque literature. The project is to organize a seminar by Professors Gloria Siracusa and Lorena Pacheco, and advanced students Karen Madsen, Liliana Maldonado and Irnela Denicolai, all from the Comahue University. There are also activities at the club that are not directly related to Basque culture but are part of the services provided by the club to the community. These include an English workshop with professor Patricia Iriñiz, and an Aerobics workshop with Vanesa Quevedo, along with another workshop on the preparation and tasting of drinks entitles “Let me buy you a drink,” taught by Claudia Battias. All the courses will take place at the Neighborhood May Union (San José Feliciano 845 and República de Italia), and are taught by club members. The board of directors thanks them for their commitment to and willingness of the teachers to teach at the club.